The intimate associations between plants and the insects that eat them have helped define and shape both groups for millions of years. 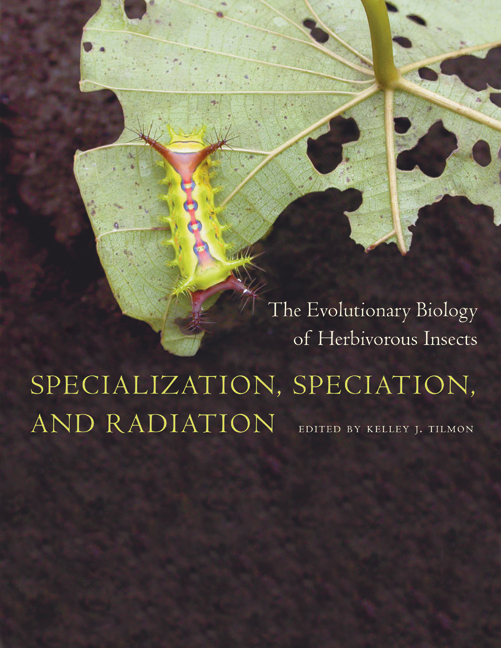 This pioneering volume is a comprehensive, up-to-date treatment of the evolutionary biology of herbivorous insects, including their relationships with host plants and natural enemies. Chapters focus on the dynamic relationships between insects and plants from the standpoint of evolutionary change at different levels of biological organization—individuals, populations, species, and clades. Written by prominent evolutionary biologists, entomologists, and ecologists, the chapters are organized into three sections: Evolution of Populations and Species; Co- and Macroevolutionary Radiation; and Evolutionary Aspects of Pests, Invasive Species, and the Environment. The volume is unified by the idea that understanding the ecological framework of the interactions between herbivorous insects and their host plants is fundamental to understanding their evolution. Kelley J. Tilmon is an Assistant Professor of Entomology in the Plant Science Department at South Dakota State University. 10. Sympatric Speciation in Herbivorous Insects: Norm or Exception?